If you have been following the Anniversary celebrations on Our Daily Bread Designs Blog, you know that today Our Daily Bread Designs is celebrating their 8th Anniversary! Along with the Anniversary celebration, ODBD is releasing FOUR Special Edition Anniversary stamp sets and TWO ODBD Custom Dies. Today, the design team is showcasing these stamps and dies with a special Anniversary Blog Hop! Continue reading below to see how you can win one of 8 Blog Hop Prizes just for leaving comments on the participating designers blogs! 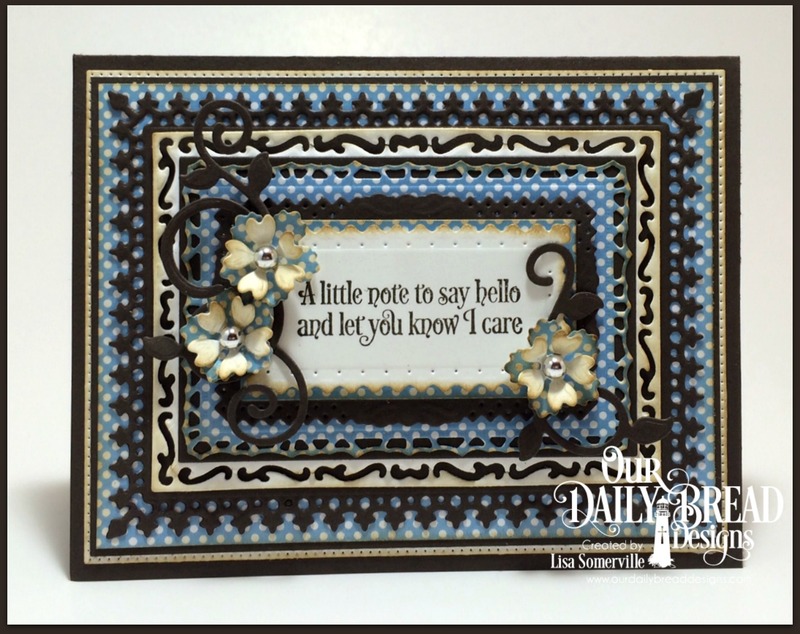 I'm sharing two cards using sentiments from the Faith Card Sentiments stamp set along with the new Lavish Layers and Filigree Frames die sets. Both cards also additional ODBD products (see supply list for details). On my first card, I die cut and embossed the largest die from the Filigree Frames die set, then cut the die in half so that I could use it as a smaller die to frame the sentiment, layering additional ODBD dies on top of the frame. I'm a huge fan of adding layers to my cards, and this next card has TEN different added layers! Eight randomly selected winners will each receive a $25 gift certificate to the ODBD Store just for commenting on the Design Team cards! You have until March 19, 2016 at 9:00 p.m. EDT to leave your comments on the Designers Blogs for a chance to win! The Winners will be posted on the ODBD Blog on March 24th, so be sure to check back there to see if you won! Love both cards Lisa done in your signature style.............but 10 layers!! You have so much patience and creativity! Thank you for sharing. Pretty pretty. Absolutely Stunning cards!!! I LOVE the color choices you chose, and love the frames/stamps you used! Gorgeous cards!!! Beautiful Lisa! 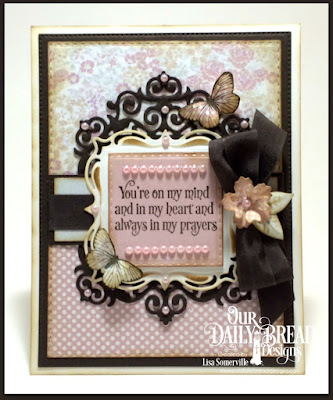 I especially love the pink and brown card, I love that color combo. I love the pearls and the pretty, REAL looking butterflies!! Ha, I just noticed that you shortened the filigree frame, what a fantastic idea as well!! Beautiful bow with flowers too! I love the second one with the pretty flowers on the frame too! Beautiful cards-just love your color combinations! wowzers! Lisa, I love your first card, it's simply amazing! The second one is beautiful too with all that layering! Beautiful artful cards, Lisa. I especially like the first one. Your style shines through on these cards. Thank you so much for sharing your talent. Love the color combos...lovely! Praying for sweet Grace! Beautiful cards! I love how you cut down the filigree die, looks gorgeous! How blessed we are that you love to may so many layers. These cards with the new dies and sentiments are so sweet. I love the Filagree Frames. They are my favorite. Fabulous! Love how the brown showcases all the layers. Both of your creations are gorgeous, Lisa!! Love the rich colors! Your combo of the pink with the black is so bold on the first. The layering on the second with the flowers and the sponged edges is beautiful!! So beautiful Lisa! I love the espresso, pink and vanilla! Beautiful color combo! And your second card is gorgeous too!!! WOW! beautiful cards! loving the new stamps and dies! Both are beautiful Lisa! Love how the black pops all the gorgeous layers on both! Quite handsome cards in colors and textures! Love the added details too! Beautifully done! Wonderful cards. I like the butterflies on the first one. Oh my! Your blue card is so striking and perfectly layered. My eyes don’t want to leave it. So much movement yet not a bit overwhelming, just mesmerizing. And the pink card is so pleasing to the eye with its subtle forms and bling yet bold contrasts of the black on softer colors. I want the pink and black on my wall. That level of artistry begs to be displayed. I'm running out of words. Every set of cards is so stunning and beautiful. Love your color choices and pretty butterfly and pearl embellishments. What a lovely showcase for this great release - your cards are beautiful, with so many great details. Thanks for sharing your talent. Great beautiful cards of encouragement. I'm in love with your first card, color choice, clever use of the new dies, gorgeous! And TEN layers on your second.... wow!!! Fabulous samples for this release, Lisa!! the layers and colors are just amazing together :) tfs! Both cards are gorgeous, Lisa! 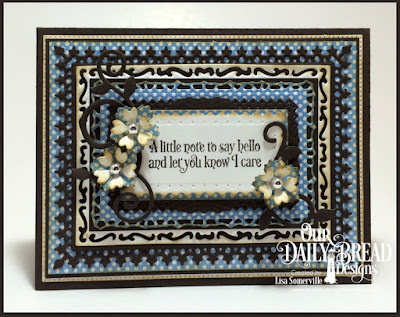 Love the way you altered the Filigree Frame! The layers, colors, and added accents are stunning! Your creations are always so inspiring! Hugs, my friend! Super gorgeous, both of them!!! LOVE how you re-sized the Filigree frame and wowza, 10 layers on the 2nd!! You are a machine, girl!! HUGS! You had me at pearls! These cards are beautiful! Beautiful, Lisa! Both are wonderful w/ all the layers & embellishments. Love the colors & pretty flowers on both. Love the pink with dark accents. Your layers are stunning. Both cards are very pretty, but I have to admit, that the first is my favorite it's done in my favorite color and one of my favorite color combos. Thanks for sharing. Such pretty cards! I'm a big layering-girl too! Love that you got 10 layers on one card. The Master At Work! Wow, 10 layers! I counted, there are indeed all there, lol. Both cards are stunning, xoxo. LOL...love Aimeslee's comment..the master at work!! Yes, they certainly have your trademark look although the 2nd is a little different for you. If course I am in love with the pink/brown card...so PRETTY! The blue polka dots is so awesome too!! Thanks so much for EVERYTHING you do to help me grow ODBD! Hugs!